I finally subscribed to 2013 Club Eternia, for two primary reasons. The first is I found out that those vehicle-themed chestplates on the Fighting Foe Men can be removed – I wasn’t aware of this fact, and I really disliked those. I just thought they were too cheesy. Without them, the figures look much better. The second reason is that I’ve found my MOTUC reviews are one of the main sources of traffic I get here on PGPoA; and especially since so many of you may not be subscribing this year, I’ll be providing more of an actual service by reviewing them so you can decide whether they’re worth tracking down on the secondary market. Speaking of Club Eternia, NoisyDvL5 over at IAT has written an editorial on the topic. It’s the kind of editorial I might have written four years ago before I got so old and jaded and lazy. Speaking of lazy, it never even occurred to me to get an interview with the creator of Castle Grayskullman like Pixel Dan did. I do have some other interviews coming, though. I’ve been wondering whether S.H.MonsterArts would continue past King Ghidorah. The answer appears to be yes; Godzilla Jr. and Burning Godzilla (both from Godzilla vs. Destroyah) are coming. The Burning Godzilla appears to be a new mold, or at least have some newly-molded parts. I will be reviewing The Dark Knight Rises eventually. Hopefully this week, if I can carve out the time. Because I forgot to change my address on my specific Club Infinite Earths order that I made last year, my CIE order for this month was sent back undelivered. This despite the fact that I did change my address on the main Mattycollector site – which, as we all know, does not change your address for existing orders, only future orders. To change the address for existing orders, a feature found on almost every modern retail website, is apparently far beyond the capabilities of Digital River. How I loathe that company. Why, why would you go with a company best known for delivering digital product fulfillment rather than physical? I’m guessing the answer is contained in two words: lowest bidder. You get what you pay for. Anyway, theoretically I’ll be refunded for my two CIE items and I don’t plan on fighting to get them back. I’d rather have the money. Good luck with the subscription! I've never subscribed to the line — I just cherry pick — so I can't even begin to imagine tough of a decision that must have been for you. And thanks for the review link! It was a surprisingly tough decision, but what with having bought a house recently with Dr. Mrs. Ghostal, I can't just commit to a $650 proposition willy-nilly. Good luck with the house! We have been in ours six years next month and once we survived that first year things got a lot easier. I swear that no inspection uncovers every little thing. I've never subbed, and won't be, but the chase for Rammy will be epic. So the chest pieces can be removed from the FFM. Do you know if those chest pieces are held in place with pegs or "snap" in place without the need for pegs? No idea. I suspect it's the former, because otherwise it would be difficult for the smaller interchangeable Horde symbols to stay put. That's what I'm afraid of too. I'm not a fan of those figures, but remove those chest pieces and I think they will be okay. Just didn't want to have giant peg holes in their chests then. Honestly I don't think I'll mind the chest holes too much. And we don't know yet, they might give us a small circle plug like Stinkor and Bow. Are there pictures of them without the chest pieces or with the Horde symbols somewhere? See, I loved the initial FFM reveal, vehicle-specific armor & all, but seeing the Attak Trak driver with the Horde symbol, man, that just works! On a Transformers website. Makes sense. thanks for the shoutout on the FXBB poe. i truly appreciate that. "I will be reviewing The Dark Knight Rises eventually. Hopefully this week, if I can carve out the time." It's definitely worth a viewing, if only to see Scott knock over his own figure, but he explains the plans to release all the missing vintage, PoP, NA, and Filmation stuff in 2014 if the '13 sub gets the minimum. remember – a movie is a fleeting event. yeah…..I really wish he would've left out that part and the rest of the "cut this out of your daily budget to afford MOTUC" crap. That's not helping the cause. well, I'd be able to afford a lot more coffee without the sub! Maybe I'll have a coffee and see a movie – What do you think of that, Scott? That whole "It's only .16 cents a day" and "skip a cup of coffee" stuff is absurd. What is this the ChildFund or MOTU Classics? Seriously. And then he says that these figures last forever? These are the most childish pleas I've ever seen. Tell you what TG, I'll sign up for the sub again this year if you DR just charges me 16 cents a day. That'd be a lot easier to swallow than $75+ on whatever month the FFM come out. Which will probably be some month where four other things come out. I realize TG is in a tough position, but some of this stuff just seems way out there to me. And where does the extra $3 or whatever per DOS figure in? If the price increase holds them for 2 years, then why do DOS figures have an additional price increase? Shouldn't that help to level out any lack of funds from the subscribers… Or is that not even valid because they're supposedly not doing DOS figures this year? I know that the status of MOTUC is the big news item at the moment but I'm surprised there really hasn't been much mention of the state of Club Infinite Earths subscription status. The thermometer for that isn't doing too great after a couple of weeks now… Poe, did you subscribe to CIE and if not was there a particular reason? I didn't, and won't. I lost interest in DCUC years ago, and while I've tried to keep getting the Bat-characters, I have no interest in any other characters. I even regret this year's sub, although I suppose it'll be nice not to have to track down Poison Ivy and Black Mask in aftermarket prices. I'm worried for CIE next year, though. I don't see how they get to the numbers they need. I also moved this year – April 1 – and the March figure that shipped on March 15 just couldn't get to me in any reasonable amount of time, and Canada Post sent it back to Digital River, without trying to forward it to my new address. This wasn't *entirely* Digital River's fault. So, in early April, I called DR, and we had a long talk about why they couldn't take the KK that had just been returned to them, and ship it back to me at my new address. Felt like your Wind Raider all over again. In any case, they just can't do that sort of thing. This is totally on them. So, we changed all my addresses in early April – billing and shipping on my account, on my past sub orders for MOTUC, 30th ann; and Club IE. My MOTUC items started arriving at my new place, and so did the 30th anniversary figs. When it came time for The Flash to ship, though, he was the final completion of my 3 sub orders from last July, and somehow DR pulled up the old invoice, ignored the changes we made, shipped Flash to my old address, and sent me an e-mail saying they'd just shipped an order worth $93.95. We've had a number of fights since. Metron and Atrocitus arrived with the other sub orders… but I still haven't seen Mr. Garrick. If I don't subscribe this year, it will be entirely because of the way I was treated this April, and since. What is it about changing one's address that Digital River has so much trouble with? I have been thinking of subscribing to MOTUC, but I will be moving mid-year in 2013, and I don't want to have to deal with that nonsense. Wow. That picture makes me sick. Some nice looking loose 80's/90's GI JOE figure in there. Good luck, MOTU collectors. I'm surprised this line has gone as well as it has. 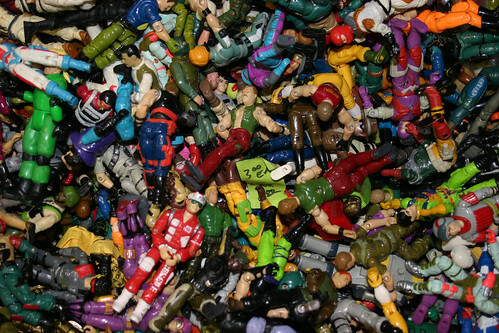 Nostalgia has a price tag and Mattel may have exceeded it for a lot of people. You can only get so much out of a fanbase.